Need help with your marketing? More Than Venice is here to offer the assistance you need. Use the resources here to help you learn more about marketing and grow your business. 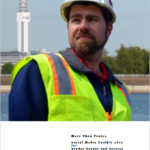 The ultimate guide for managing your trades services business. Ideal for Sole traders, contractors and SMEs. Once a week, we will provide you with the latest marketing insights and resources including practical ways to transform your business with as little as half an hour’s work. Emails will arrive every Wednesday morning to help you get over the hump-day and you can unsubscribe at any time. Join our mailing list using the form below. Need something you don’t see here?